The word frittata comes to us from the Italian fritta for "fried." It is believed that the frittata - like the French omelette and Spanish tortilla - was introduced in Europe by the Arabs. This implies that the frittata made its way to Sicily before becoming popular in peninsular Italy some time after the year 900, or even after the Norman conquest of Sicily beginning in 1061. This places it in good company, for the Arabs introduced a number of foods in Sicily, including oranges, mulberries and sugar. The frittata, tortilla and omelette are close cousins, perhaps even siblings, but they're not identical. What's the difference between a frittata and an omelette (the traditional French version of the omelet)? Each food expert has a different answer, but most would agree that a frittata is made from beaten eggs into which various ingredients are thoroughly mixed with cheese (before cooking), and the complete mixture is then fried slowly over a medium flame in extra virgin olive oil, whereas an omelette consists of beaten eggs rapidly cooked (in butter) into which the cheese and other contents are then added and folded. In other words, the frittata's ingredients are mixed into the eggs, but the omelette's are contained in a kind of crepe. It may take five or six minutes to fry a frittata, but a decent omelette can be cooked in two or three minutes. To the French the preparation of an omelette is a precisely defined art, and certain omelette recipes have endured for decades. In Italy, where the culinary artistry is equally refined but far more individualistic, the traditional recipes are the object of constant experimentation. Unlike cannoli and other conventional treats, the Sicilian frittata is the result of proud creativity. There is no "definitive" frittata recipe. While an omelet is usually made as a single serving for one person, a frittata can be prepared as a large affair and later cut into servings like a pie, though it is perfectly normal to prepare a single-serving frittata. In Sicily it is traditional to mix local grated cheese into the frittata mixture, but there are no firm rules; you could just as easily toss in a few chunks of gorgonzola. Versatility is the order of the day. 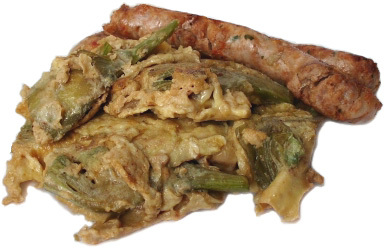 Popular Sicilian recipes call for wild asparagus or Sicilian artichokes (shown here with pizziaola sausage) or wild fennel, to which chopped ham or salami might be added. Arugula is another choice, among many, but it isn't as "traditionally Sicilian" as some of the others. Like arugula, fresh fennel or mint leaves could be chopped and mixed (uncooked) into the eggs, but artichokes or asparagus must be boiled first. The same goes for fava beans, another popular frittata ingredient here in Sicily. Capers are also popular, thoroughly rinsed to remove traces of vinegar or salt. It's tempting to add a dozen ingredients to your frittata. Don't do that. It's best to let just one or two flavors predominate. Either fennel or mint, for example, are fine by themselves, with cheese and perhaps some chopped tomato. Cooked fava beans go well with boiled artickokes (all chopped). It's a question of finding flavors that are complementary. Restaurants sometimes serve frittata wedges at room temperature, but purists in love with Sicilian country life insist on single-serving frittatas served steaming hot. For our photograph we cut the artichokes into quarters so that you can see what they are, but it's probably more appropriate to chop the ingredients into smaller pieces. It's worth mentioning that the frittata, though served as either a breakfast or lunch course today, was always popular in the morning. The idea that Italians "historically" favored the so-called "Continental" breakfast of a crescent roll and a cup of cheap coffee is nothing short of ridiculous. In Sicily the frittata has been popular for centuries; the "continental" breakfast was popularized with Italians' migration to the cities after the Second World War. It has more to do with "fast food" and the desire of hotel managers to feed their guests a "free" breakfast at low cost than with the true culture of Sicily or any other Italian region. (The crescent roll itself is respectable enough but hardly "Italian," having made its way into Italy with the Savoys via Turin, Italy's "Little Paris.") Viva la frittata!